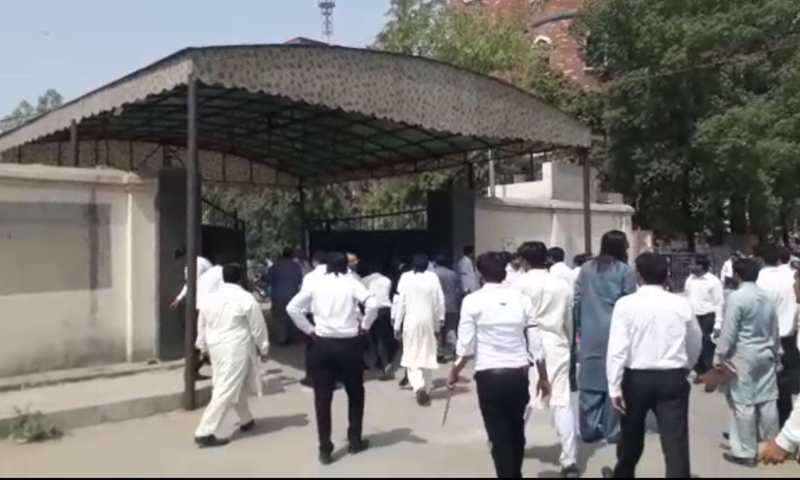 A large number of lawyers in Faisalabad resorted to violence in protest on Monday after more than 30 of their colleagues were booked in a case under terrorism charges. The case was registered against the lawyers on Sunday for allegedly manhandling Dijkot police station in-charge and his staff on a district court's premises when they reached there to produce a suspect before a judge. The suspect was said to be a brother of one of the lawyers. On Monday, some lawyers' representatives asked the police to withdraw the case but police officials refused to oblige them. The refusal enraged the lawyers, who held a demonstration at committee chowk and got a nearby market closed. The protesting lawyers then attacked the CPO office and injured three policemen deployed outside the office. 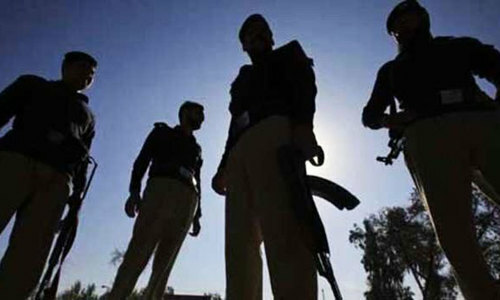 Faisalabad Police spokesman Amir Waheed told DawnNewsTV that a suspect named Malik Shahid, brother of lawyer Malik Arshad, was booked by police on April 25 in a case involving Rs2 million under section 406 (punishment for criminal breach of trust) of the Pakistan Penal Code (PPC). According to the spokesman, when Dijkot Station House Officer Malik Waris produced the suspect before the court on Saturday, some lawyers attacked the policemen accompanying him. The lawyers not only hurled life threats at the cops but also tore their uniform, snatched cash, ID cards, service cards and other valuables. The policemen were also subjected to unlawful detention, he claimed, adding that the lawyers’ act of violence terrorised the litigants and others present on the court premises. The lawyers were subsequently booked under the Anti-Terrorism Act. 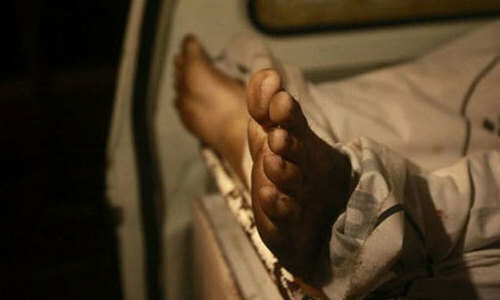 "Now more cases will be filed against the agitating lawyers for attacking police and public properties," Waheed said. Faisalabad District Bar President Malik Mohammad Amjad denied all the allegations and said that the SHO had arrested the brother of a lawyer without any justification. He alleged that the police officer had misbehaved with the lawyers at the court premises. 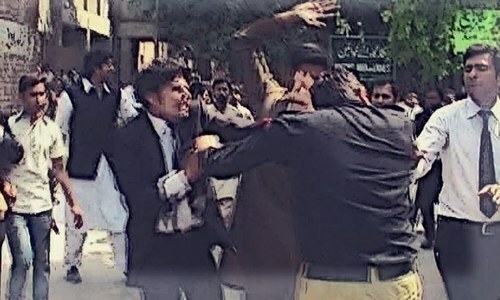 "Some junior lawyers had exchanged harsh words with policemen. 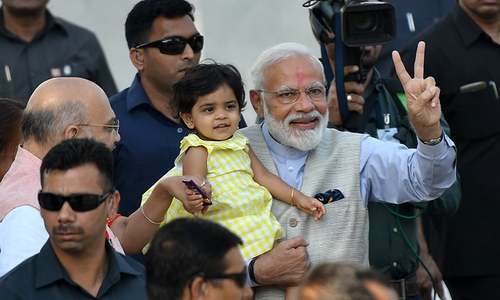 Subsequently, both the parties scuffled with each other," he said and categorically denied charges of kidnapping or unlawfully detaining the policemen. "We are protesting because the police booked the lawyers under terrorism charges and that was unfair," the lawyers' representative said. People who are suppose to respect the law, unfortunately today they are breaking it what you can expect from common people!! Two corrupt to the core communities. They will agree to let pass. Our Police has traditionally suffered from a poor reputation. Our Lawyers have, however, crossed all limits. Right now they are the most in-disciplined. Get the videos of the incident, trace and charge everyone and send them to jail without bail for 90 days, next day same rehearsal, keep this drill until all kala coats get lesson. Lawless lawyers! The sad commentary and irony of Pakistani legal system. I hope CJP takes immediate notice and sends all these thugs to jail. Those who cannot abide by the law, or have no respect for the law or law enforcement agencies, should not be allwed to call themselves 'LAWYERS', much less practice the 'LAW'. It simply shows their lack of understanding of the law, and low quality of their legal training, ethical standards and regard for the equal justice for all. Sorry to say this, but Pakistanis cannot control their emotions. Lawyers taking the law in their own hand, great country. Mentally there seems to be no difference between a graduate and an illiterate. The GANG must be brought to justice,they have been acting like a mob and getting away with everything they do.most are corrupt and dishonest, Please do not compromise with these terrorists bring them to justice ASAP. These lawyers are goons who graduate by cheating with low grades.No knowledge and academic competency and credibility. These lawless lawyers should be taught a lesson. Infact there should be a training centre for lawyesrs to teach them ethics and professional manners. What a terrible and mind-boggling situation when attorneys instead of preserving and protecting the rule of law, start taking the law into their own hands? Unfirtunately, this is not a strange, isolated or exceptional incident in South Asia rather it's a norm in that part of the world. The lawyers can fight their own cases charging themselves hefty amounts as fees, paying income tax on their earnings from the same.